The winter musical, The Addams Family, is preparing to go up, opening on Thursday March 3, with performances on Thursday and Friday at 7:30 and closing with a matinee at 2:00 on Sunday March 5. Tickets are available online now at www.d-e.org/arts and will be available for sale in the D-E School Store in Klein Campus Center, beginning Monday, February 29. For additional information go to www.d-e.org/arts. Thursday March 3 is a very special day, because at the same time the musical starts, our elite US string ensemble StringJam will be performing at Carnegie Hall. If you are interested in this performance, you can find additional details (including ticket information) at www.d-e.org/news. As we near the end of February it’s time to alert you to the activities taking place between now and spring break, which begins on March 18. It is going to be a busy few weeks. Our second exam period will take place on Wednesday March 16 and Thursday March 17, with regular classes on Friday March 18 (unless we have weather delays that week). Generally, students in grades 9 and 10 will have a history exam on Wednesday and an English exam on Thursday. Students in grades 11 and 12 will have a mathematics exam on Thursday and a language exam on Thursday. Further details to follow; each student will receive an individualized exam schedule in about a week. We are also preparing to start the course selection process for next year. That process includes an evening for parents of students in grades 9-11 on Monday March 14, starting at7:00 PM. At that time the deans will describe the curricular choices available to your child. This process will continue into April and there will be plenty of time for all the necessary conversations and planning. This meeting will be only the start. You will receive more information as we get closer to that date. This program will be preceded by a college round table at 6:00 PM. On Monday March 7, we will be suspending regular classes in the morning to participate in what I hope is the first of an irregular series of symposia on particular topics of interest and/or relevance in the world today. Our first symposium will be on religion. Our focus will be on why religion is so difficult to talk about and how we might start to ease that awkwardness here in school. Students and faculty on this campus have thriving parts of their lives that revolve around religion and we do not often enough recognize or attempt to explore that aspect our lives. This happens for good reason, and we want to both expose and explore that reason. We also want to raise awareness about the importance and influence of religion in the lives of individuals, families and larger societies around the world. Please know that it is not our intent to enter into a discussion about the merits or values of one religion as opposed to another, or the value of religion at all. Much like we have spoken in school about race, ethnicity, or sexual orientation, we aim only to begin to discuss these issues of emotional importance in ways that are appropriately respectful and empathetic. We have invited the head of religious studies at NYU as our keynote speaker. Dr. Zvi Ben-Dor Benite is a professor of Middle Eastern and Islamic studies and he will contextualize religion in a way that we hope will help lower the barriers to conversation. Other guests include Rabbi Yehuda Sarna and Imam Khalid Letief, both chaplains at NYU (Jewish and Muslim respectively) who teach together and form the leadership team of the Of Many Institute, a multifaith organization whose purpose is to cultivate cross-cultural leadership experiences, with a focus on students who seek to develop a multifaith space that ensures harmonious relationships on campus. Our ultimate cultural goal for Dwight-Englewood is very much the same as the Of Many Institute, albeit the high school version, and we are very pleased and honored to be working with them on this program. We realize that this is an ambitious goal, but it is important for our community and so we will make a start with this event. Future subjects for us to study might include climate change and sustainability, and perhaps the Middle East. Please be sure to ask your child about this program. Well the snow from winter storm Jonas has about melted and it’s back to being 50 degrees, so while you might feel like it’s April, it’s really only February. It was no surprise that punxsutawney phil and all the other groundhogs in America did not see their shadows; our somewhat unusual weather pattern is confusing to all living things, not just humans, and for those who are studying these patterns it’s pretty concerning in the long run. I am not writing about climate change, however, but to alert you that we have now changed semesters and in the middle of the add/drop period for the spring term. Students have until the tenth of February to move courses around and settle in their preferred spots. You child’s final semester grades are now available through the D-E website (see right for instructions on how to access). We will be taking time in advisory this week to go over grades with students, and I hope that you will do the same. Being able to reflect upon and review these grades with others can help students make changes that improve habits and skills. In fact, it may well be that these conversations are more likely to make a difference than the grades themselves. We should all be working to help your child understand his or her own behaviors and how they connect to achievement. As always, while we want to keep your child in the center of this process, please contact your child’s advisor or dean directly if you have questions or concerns. You should also contact any classroom teacher if you have particular aspects that you would like to discuss. Lastly scroll down to see a video and a photo from the NLI signing ceremony earlier today for Taylor Krakower ’16. Congratulations to Taylor and her family on this accomplishment. Taylor Krakower ’16 during her NLI signing ceremony for Wingate University, held at 1:00 PM on Wednesday Feb. 3 in Hulst House. Congratulations Taylor Krakower ’16! 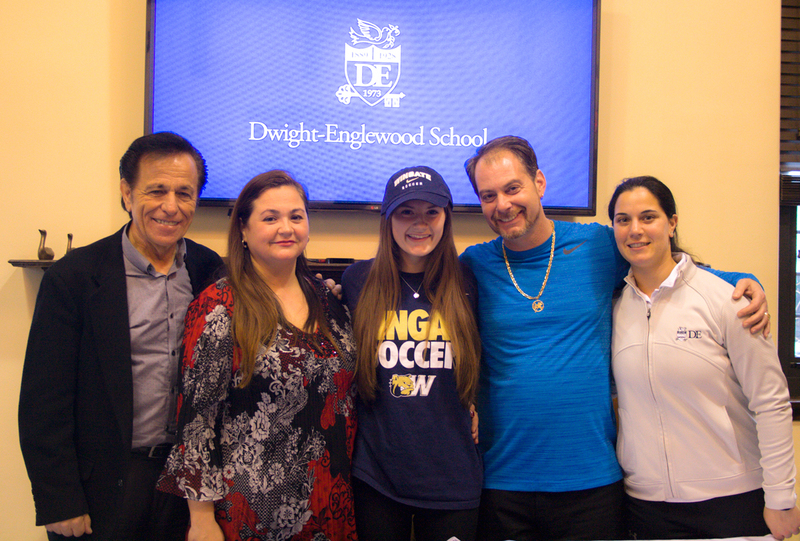 Here is Taylor following her NLI Signing Ceremony, shown here with D-E Girls Varsity Soccer Coach Eddie Ballas, her parents, and Assistant Coach Jaclyn Wood. Krakower signed to play for Wingate University (NC). Earlier this year Taylor became the Bulldogs’ all-time leading goal scorer with 138 total, surpassing by 3 goals a D-E record previously held by Rachel Cole ’12. Also joining Taylor during the ceremony were D-E Head of School Dr. De Jarnett, AD Eli Goldberger, her teammates, Upper School friends, and D-E faculty and staff members. Click here for video footage from the ceremony.